Funded by te European Social Fund, Trendwolves is working on a project to empower graduated art students in their professional career by focussing on entrepreneurial skills. Four out of five Belgian, graduated art students are still looking for a job one year after graduation. They are undervalued and struggling to convince possible customers or future employers of their economic, added value. Besides that, a focus on entrepreneurship is almost absent in most Flemish art schools and students experience this as a major lack. These youngsters are talented, creative, skilled and ambitious. Most of them want to make a living out of their skill, but few of them know how to do so. On the other hand we see creativity as the skill of the future. Our economy has become faster, more complex and unpredictable than ever before. We stand before unprecedented challenges that bring our economic model into a permanent crisis. How can we handle this? We need creative solutions to be innovative: thinking outside the box, being critical towards the constantly changing contexts, co-create & co-reflect. With our ESF project, we want to bring those two actors (businesses & young artists) together. So they can learn from each other and share skills. We want to do this through a two day, creative hackathon. 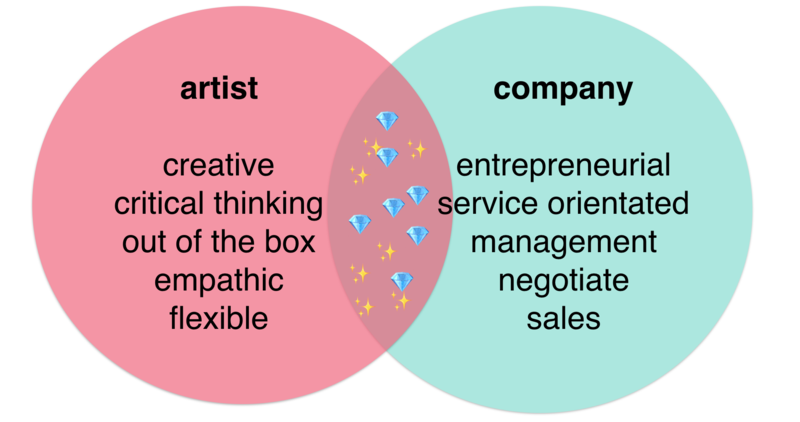 Where businesses can gain insight in ‘creative thinking’ and young artists can develop a more entrepreneurial mindset. Were are currently working on a pilot that will be ready summer 2018. Sooooo, stay tuned!